This wasn’t a planned recipe. This was a late night dinner that happened to be awesome. 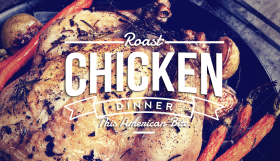 Wednesday night is usually grocery night in our home, and this week was no exception. Somewhere between an emergency visit to the dentist for me, a quick dinner and bed time for our two year old son, and a class at the gym for my wife, we forgot to sit down and eat dinner this evening. 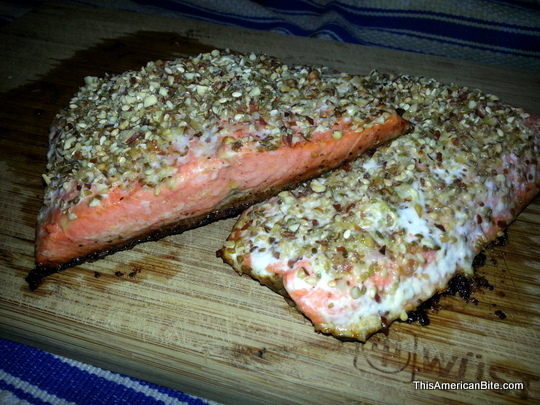 When I got back from a frustrating visit to both Trader Joe’s and Walmart, it was time to cook and dukkah crusted salmon was on the menu. Information! Not loving the dukkah? Here are some ways to cook salmon. Dukkah, sometimes spelled duqqah, is an Egyptian nut and spice blend often made from hazelnuts, almonds and a Middle Eastern blend of spices. I discovered dukkah in Trader Joe’s a few weeks ago, and the instructions to “take a hunk of crunchy bread, dip in olive oil, then dip in dukkah” was enough for me. After buying one jar and loving it, I went back to the store to buy every last jar they had last week for fear that it was a seasonal item. 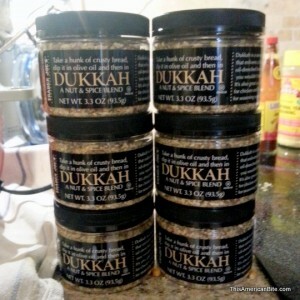 Tonight, the local Trader Joe’s was out of dukkah, so was their warehouse, so I feel like a winner! The front of the label suggest warm bread and olive oil, and the back of the label suggests this nut blend as a crust for chicken or fish, so at 10pm tonight, once errands were done and there was time to think about eating, I followed the advice on the label and made the best salmon I can recall eating. Coconut oil really is ideal for this recipe as it tolerates high temperatures very well and will help you get an awesome sear on the bottom of the fish. 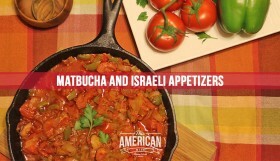 See my archive for more ways to cook creatively with dukkah. Please consider this a guide, and not a definitive recipe – have some fun with the spices or flavors and if you think something would work better, let me know. Put one tablespoon of coconut oil in a cast iron skillet and put it on a high heat. While the coconut oil is heating, pat both sides of the the salmon dry with a paper towel. Sprinkle the underside of the salmon skin with a generous amount of garlic powder, paprika and freshly cracked black pepper. 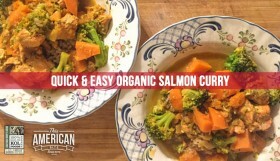 If you have a fish or salmon spice blend, you could use this too. 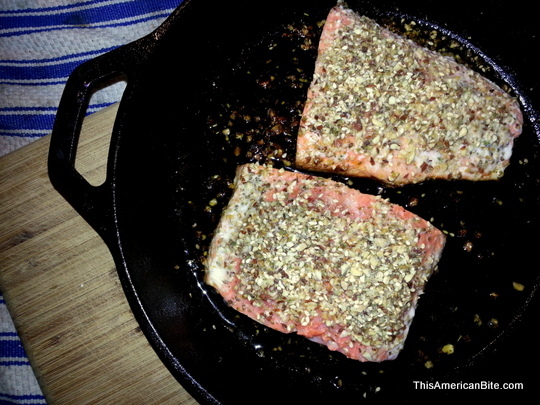 Once the oil is hot, add the salmon to the cast iron skillet and cook on a high heat for five to eight minutes, or until the underside is looks crisp. Remove the cast iron skillet from the heat and squeeze the lemon over the fish. 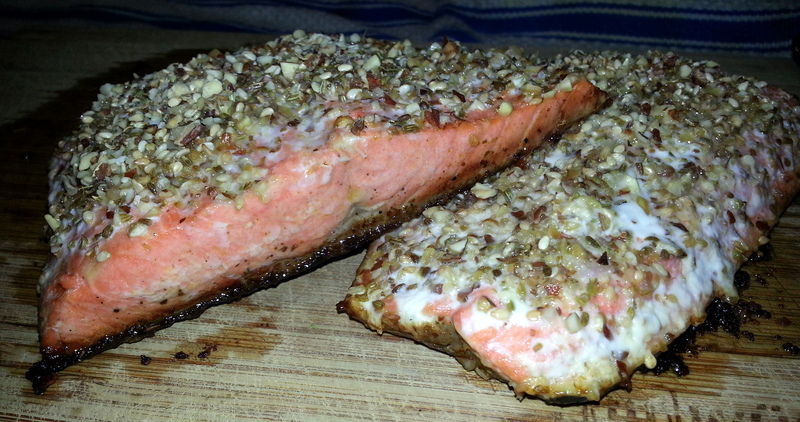 Cover the top of your salmon with the dukkah nut blend and put into the oven for five minutes to the middle can cook. 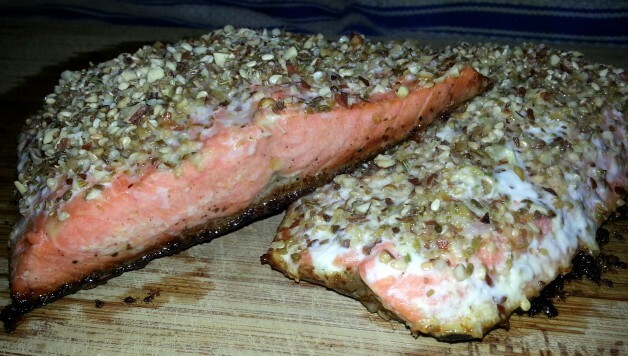 Before the salmon is fully cooked, turn off the oven and turn the broiler to low for five minutes so the nuts can toast. Remove from the oven before the nuts burn. Give the salmon a couple of minutes to cool, then serve. A recommended serving of salmon in 3oz so you could stretch this dish to serve up to five people. 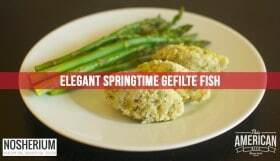 I served this with green beans caramelized with balsamic vinegar and brown sugar which were also delicious and were quick to prepare while the salmon was cooking. 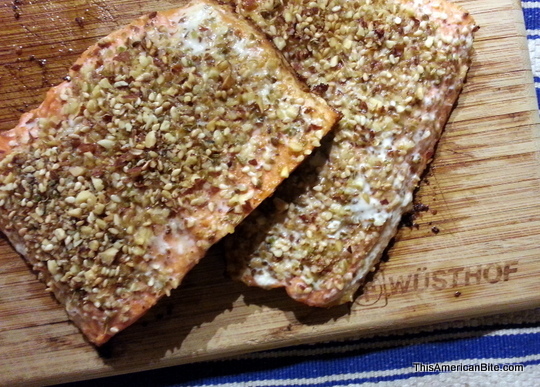 Check out the crisp underside of the salmon in the photo below. That’s comes from the high cooking temperature, spices on the skin and the resilience of the coconut oil. Olive oil may work, but why take the chance? Leave me a comment below and tell me how you’d adapt this dish.